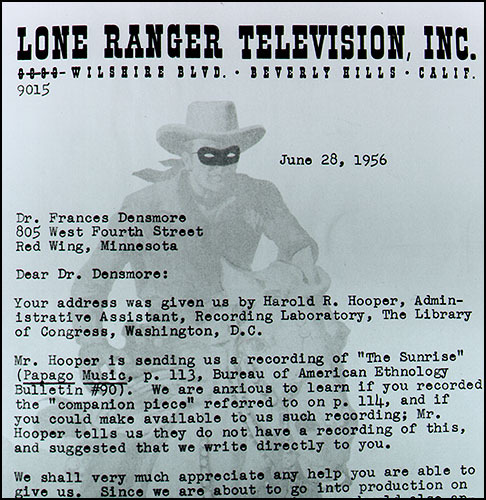 Published music based on Densmore's recordings. IN HER 87TH YEAR, Frances Densmore set out on a final recording trip. On a 1954 lecture tour to Florida, Densmore made a side expedition into the Everglades to work for a month among the Seminole. Her life back in Red Wing was Spartan, perhaps lonely. Frances Densmore's lifelong travel companion and housemate, her sister Margaret, had died in 1947. Frances sold their family home, where she had lived for half a century and took a room in a respectable boarding house up the street. There she continued to write short articles on Indian music. Frances Densmore celebrated her 90th birthday on May 21, 1957. Two weeks later she died of pneumonia and heart failure. She left a personal estate worth $9,710.46 to her cousins Mabel and Charles Densmore. By any reasonable measure, Frances Densmore led an extraordinary, productive life. Contemporary ethnomusicologists and anthropologists say her greatest scientific contribution was leaving behind such a well-documented body of original cultural artifacts, on wax cylinders, in her writings and in the thousands of objects she collected. Traditional American Indian music is alive and prospering. It survived Frances Densmore's grim prediction of cultural extinction. Each summer, dozens of pow-wows explode in colorful dance and song on reservations across the country. Each day, traditional Indian people raise their drums, flutes, rattles and voices as their ancestors did--on the prairies and in the forests where Frances Densmore traveled. This concludes the narrative of Frances Densmore's life story. Return to beginning of the life story. Go to the Magic Lantern Show introductory page.